ᐅ BEST CERAMIC COOKWARE 2019/2020: Nonstick Pans That Are Actually Safe! These days, top ceramic cookware performs even better than Teflon. 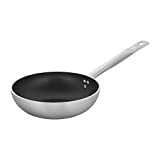 A good ceramic frying pan is just as capable of cooking effortless, no-mess eggs as a leading PTFE-style non-stick pan. More importantly, however, ceramic non-stick is totally free of the health concerns that many people have with Teflon. Ceramic coatings don’t flake, they’ve never been exposed to the toxic chemical PFOA, and they don’t release noxious fumes at normal cooking temperatures. While the best ceramic cookware will perform nearly identically to Teflon, the cheap stuff won’t. There’s a world of difference between the best and worst ceramic coatings. A good quality ceramic cookware set will be less sticky and last far longer than its inferior competition. Luckily, you don’t always have to pay more for this — in fact, many of the best ceramic cookware sets on the market are some of the cheapest. If you’re looking for accurate reviews of some of the best ceramic pots and pans on the market, keep reading! We’ll go over the specific details of several cookware sets, several individual pots and pans, and talk about what features you should look for when comparing sets on your own. Finally, we’ll talk about how ceramic non-sticks work and why I think they’re slightly better than Teflon in just about every way. The intersection of price and functionality in this T-Fal cookware set makes it one of my favorite sets, period. It’s got an effective, durable interior coating that’s impressively easy to clean and use, it’s dishwasher safe, and it’s cheap enough that you won’t mind replacing it every few years. Despite the low price tag, however, all of my friends that I’ve recommended this set to have gone for three or more years without feeling the need to replace it. First, let’s talk about the basics. This is a 14-piece set with 4 utensils, six pots and pans, and four lids. 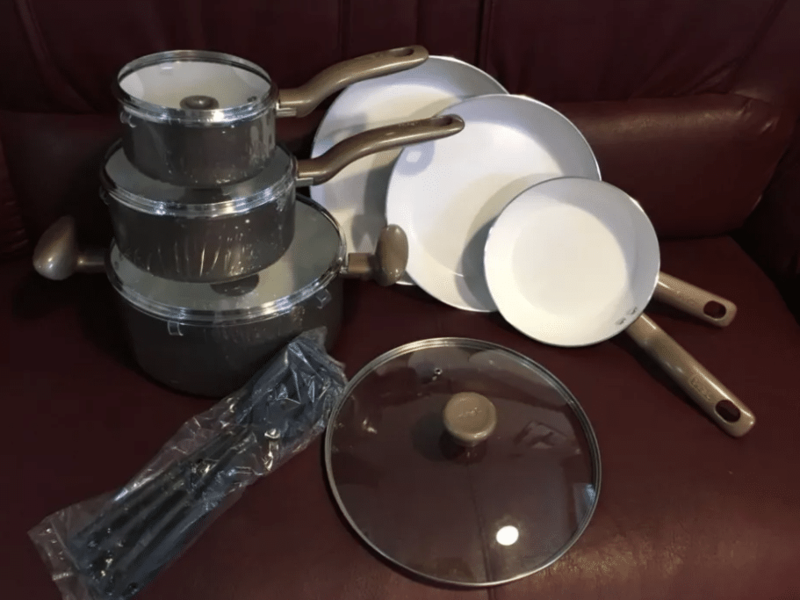 This is a somewhat small number of actual cookware pieces in a set this size, although it’s certainly not abnormal. The included utensils are fairly useable, but you’ll almost certainly abandon them in favor of any utensils you buy separately. The pots and pans themselves include three ceramic skillets, one with a lid, two lidded saucepans, and a lidded stockpot. This gives you a selection of tools you can use to cook pretty much every dish you can think of. Each piece of cookware is constructed out of a sturdy aluminum body and features polymer handles that stay quite cool while you cook. The lids are made of shatter-resistant glass and have small steam vents that prevent them from rattling. Performance wise, there’s very little to complain about from this set. It’s not the heaviest or thickest set of pots and pans on the market, sure, but what it lacks in thermal weight it makes up for in ease of use and maneuverability. 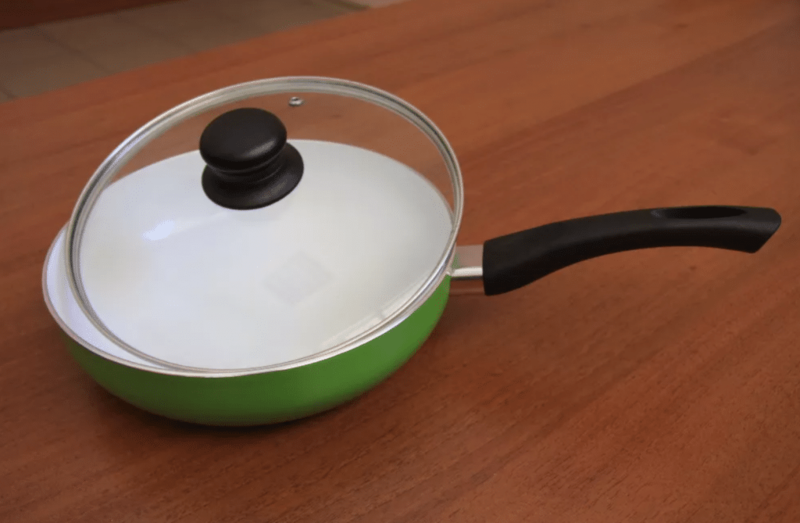 The ceramic coating used on these pots and pans is quite comparable to PTFE as far as non-stickiness goes, especially when you first take it out of the box. It’ll fade over time, which is unfortunate, but you should still get about the same number of uses out of these ceramic pots and pans as you would from a Teflon-style non-stick set. Be sure to avoid abrasive cleaners and high heat in order to maximize the lifespan of the slippery surface. The heat distribution and thermal performance of this set are also quite good. The aluminum body helps ensure that heat travels quickly from your burner to your food and is thick enough for fairly even heating. 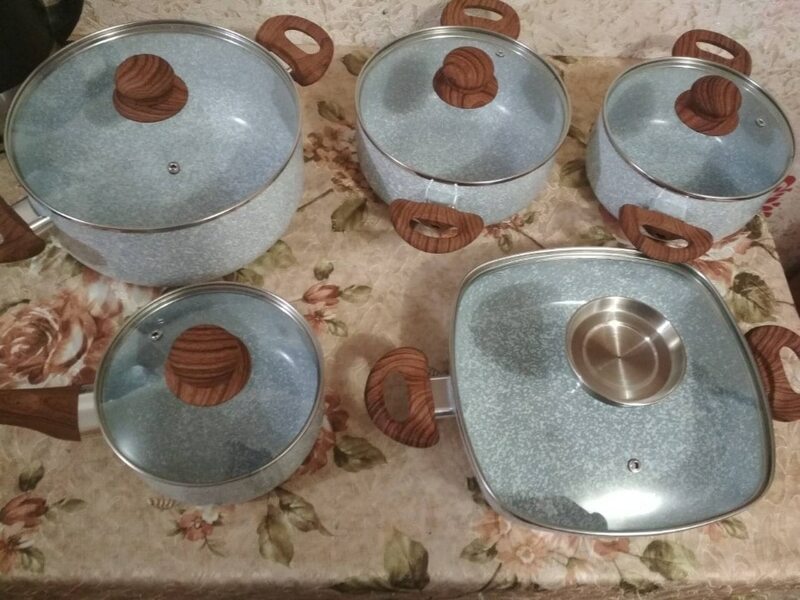 Again, the only downside is that this isn’t an especially thick cookware set, which can be helpful when you’re trying to maintain a specific temperature for some recipes. You start to see some more pronounced downsides when it comes to appearance. I don’t hate how this set looks out of the box — it’s a mite tacky, perhaps, but it’s nothing I can’t live with. The issues arise when you start to use it for a few months. In my experience, the performance of the pots and pans stays quite good after several months of heavy use, but the looks do not. The easy-to-clean non-stick ceramic is NOT on the outside of these pots and pans. Perhaps worse, the interior ceramic coating will start to show visible scratches if you’re not incredibly careful. Again, this doesn’t affect the performance of the cookware, but it certainly makes it look a bit worse. For the price, this ceramic cookware set is an absolute steal. You get fantastic cookware that’s incredibly easy to use, quite easy to clean, and very durable for an incredible bargain. If you’re looking for a basic ceramic non-stick set that won’t cost you an arm and a leg, start here. This stylish Tramontina set offers a number of subtle upgrades over the T-Fal set above. It’s made of heavy gauge aluminum for more thermal weight, it’s got a porcelain enamel exterior that looks better and is easy to clean, and it’s got soft handles that give it a distinct ergonomic advantage. It’s a bit pricier, sure, but I think it’s clearly the better cookware set. As far as pieces go, this 10-piece set compares quite favorably to the 14-piece T-Fal set above. There aren’t any nylon utensils here. Instead, you get the a very similar assortment of three pans, one with a lid, two saucepans, and one dutch oven (or stock pot, depending on who you ask). The pieces are quite similar in size and feature very similar tempered glass lids with steam vents. The differences start to become more apparent when you examine the handles. T-Fal uses screw-on handles that are made of a semi-hard polymer that stays cool while you cook. By contrast, Tramontina combines a synthetic grippable material with a stylish stay-cool stainless arc that keeps your hands away from the heat while providing a soft, comfortable surface to grab. It’s not a huge difference by any means, but I think that maneuvering a large dutch oven that’s full of water is a bit easier on your hands with this Tramontina set than the T-Fal set above. They’re also riveted, not screwed on, which is a mild plus for most households. The oven safety and care instructions are again very similar to the T-Fal set above. Tramontina warns against the usual dangers, including high heat, too much or too little oil, and improper cleaning. While the set is dishwasher safe, the slick, smooth exterior and ceramic interior ensure that it can be wiped clean in a single pass with a sponge after cooking most meals. The biggest practical difference between this and your typical cheap ceramic stainless set is the thickness of the aluminum used. This Tramontina set is heavy, with a total weight of 22 lbs. The T-Fal set above, by contrast, weighs a bit more than 12 lbs, even with the four extra utensils. This means that this Tramontina set has a lot more metal. While it will make your pots and pans slightly harder to move from burner to burner, you get some pretty big tangible upsides in return. The first upside comes in the form of more even heating. Aluminum is quite good at spreading heat out — it’s one of the best materials for this job, in fact — but it can’t do its job if it’s too thin. The thicker aluminum in this Tramontina pan slows down the heat from your burner just a little bit and ensures that it evenly spreads out over the whole pan before it hits your food. The other upside comes in the form of thermal weight. This is a concept that refers to how much heat a pan can hold. If a pan doesn’t have enough thermal weight, putting a refrigerated steak or some frozen vegetables on your preheated pan might drop the temperature by quite a bit. For most recipes, this is more of a hassle than a deal breaker, but it’s definitely something that you want to avoid if you’re trying to sear the outside of a piece of meat while keeping the center moist, for example, or even just maintain a precise, steady temperature. The pots and pans in this Tramontina set have quite a lot of thermal weight, meaning they’ll stay at the temperature you want without too much work. There’s a small downside associated with this last part when it comes to pure heating speed. Because the extra material has to heat up before your food heats up, this Tramontina set will boil water a little bit slower than the T-Fal set above. If ultra-fast heating and rapid cooling is your goal you actually want less material, not more. That said, we’re looking at a pretty small difference in time in most cases. The total amount of time you could save with the T-Fal set is likely only a few minutes per year, and that’s if you’re always immediately ready to cook the precise moment your pan is preheated. While it’s somewhat pricier, the increased thickness, better looking exterior, and more comfortable handles make this Tramontina set a clear favorite in my eyes. The T-Fal set is fine, however, so if you’d rather save money, feel free to choose it instead! One of the major downsides to both of the cookware sets above is a lack of compatibility with induction cooktops. Both T-Fal and Tramontina offer multiple options with induction compatibility, but it’s curiously absent in these affordable ceramic lines. 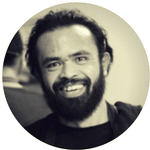 This Vermi set does an excellent job of filling that void. It’s slightly smaller than the two sets above, but it’s got a number of subtle ease of use features that help it compete. First of all, let’s talk about what’s in the set. 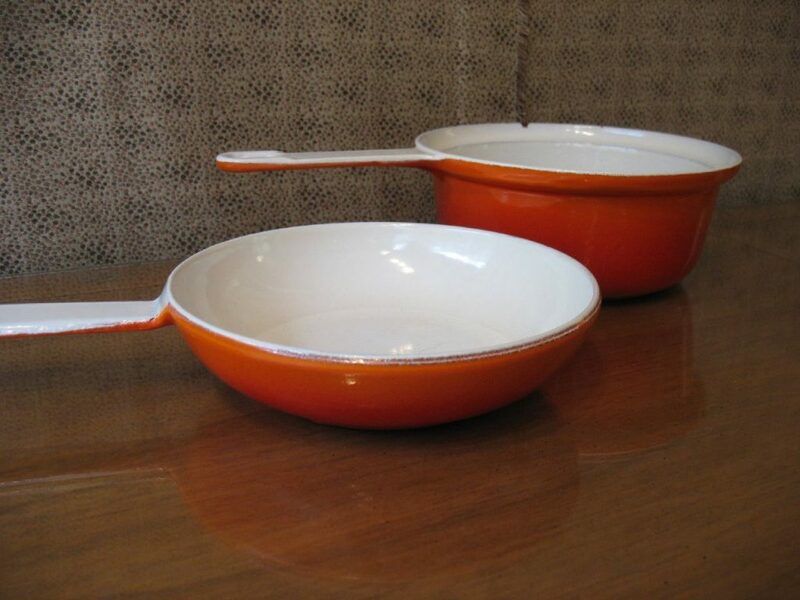 Vermi includes two dutch ovens, one casserole dish, and two angled frying pans. The dutch ovens and casserole dish have capacities of about 3, 4, and 5 quarts, while the frying pans are both about 10” in diameter. This is definitely a non-standard assortment of items, but it’s still an adequate assortment of tools for most cooking tasks. Both the interior and the exterior of this set are quite easy to clean, although they do have a habit of discoloring. As far as non-stickiness goes, you definitely won’t be disappointed. Vremi makes it a point to show off how easy it is to literally flip food out of the rounded bottoms of this cookware in their marketing material. You’ll be tossing around your stir-fries with very little effort in no time. Each piece of this cookware set is natively compatible with induction cooktops through a magnetic steel disc that’s embedded in the bottom. This disc does an excellent job of getting hot quickly. The heat distribution is somewhat imperfect, however: you may notice a hotspot or two until you let your pan’s temperature even out. If I had to change one thing about this cookware set, it would definitely be the handles. The faux-wood bakelite grips that come on these pots and pans aren’t as insulating as the polymer handles in the sets above, or at least they don’t seem that way. They’re also somewhat fragile. 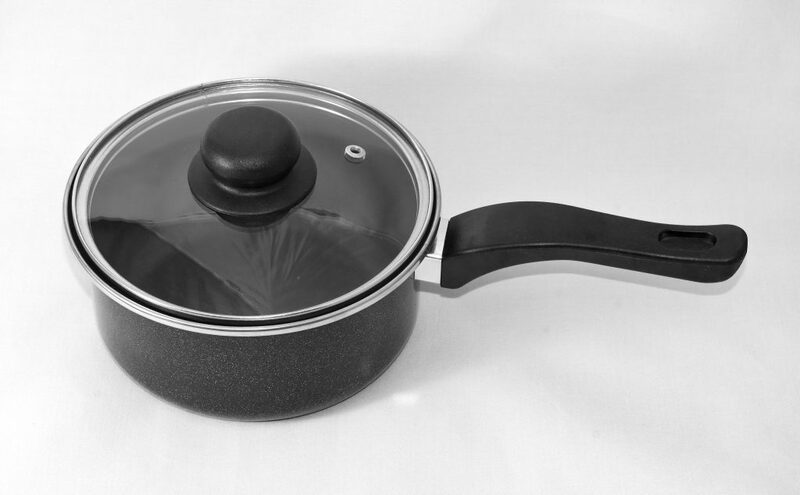 Many customers report having to contact Vremi’s customer service in order to correct handle-related issues after a year or so of using this cookware set. Still, this seems to be the exception, not the rule. This ceramic coated cookware set’s unique rounded bottoms, distinctive aesthetics, and induction capability make it a clear favorite for some households. If you’re after a quirky set that will work with all cooktops and won’t break the bank, give this a try! Before we leave the realm of cookware sets, I want to mention an additional option for people with induction cooktops. T-Fal’s Precision line gives you wonderful induction compatibility and offers no-frills function-over-form aesthetics for a small price increase over their basic ceramic set. The pans are quite similar in terms of numbers: this set weighs a little bit more than the first T-Fal set reviewed, meaning it’s got a bit more heft, but the difference is marginal. 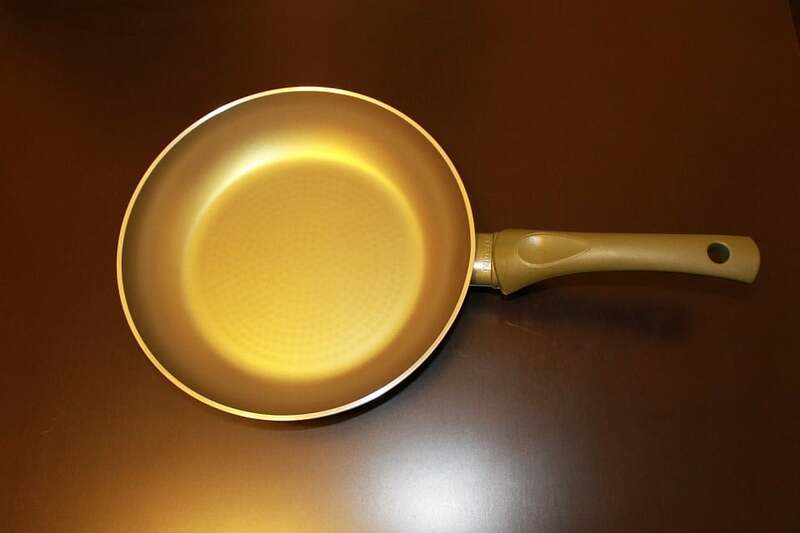 The interior coating in the pans might be a different color, but it offers very, very similar performance. This set would absolutely be my pick for the best ceramic induction cookware set if it was a fully ceramic set. It’s not. Instead, while the two frying pans (or skillets or whatever you’d like to call them) are ceramic coated, the four pots are not. They feature extra durable stainless steel cooking surfaces that will last for significantly longer than a ceramic surface. This comes at a steep cost in terms of convenience: if you’re cooking “sticky” foods you’ll have to lubricate your pots and manage your temperature carefully. That said, I find that I use my frying pans for the bulk of my “sticky” cooking. I tend to use my pans for things like pasta, soups, and stocks. If I burn something, I’ll make a mess, but otherwise I find cleaning a stainless pot to be a total breeze. This means that in my kitchen, this set is probably the best “ceramic” cookware set, hands down. 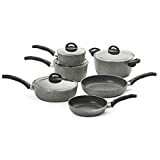 I get some pans that I can use for worry-free frying, searing, and sauteing, while the durable stainless-surfaced pots will last for a very long time. Again, this isn’t a “ceramic” cookware set. Instead, it’s split down the middle: you get two high-quality ceramic-coated frying pans and four stainless steel pots. It’s a brilliant blend that ensures your eggs won’t stick and your pots will last for a long, long time. If you’re just looking to try out induction without spending a lot, there’s nothing wrong with picking up an individual skillet or two. These pans will allow you to cook sticky dishes (like eggs, chicken, stir-fry, and more) without worrying about the cleanup. In order to get the most life out of your pan, however, it’s still a good idea to avoid high heat and use a bit of cooking fat to keep the non-stick ceramic surface lubed up. 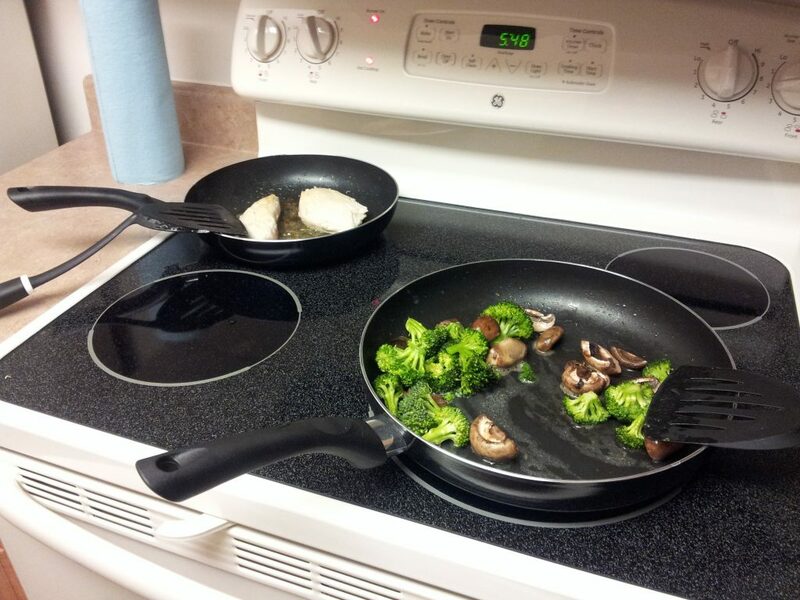 Your skillet will still work if you don’t, but it will wear out faster, meaning it will lose its non-stick properties. This skillet is slightly pricey as far as single ceramic non-stick pans go, but it’s one of the few individually-purchasable options that’s actually induction compatible. The elegant glass lid gives you a little bit more versatility with dishes, allowing you to reduce sauces faster and “cheat” on your over-easy eggs by trapping a bit more heat in the pan. If you don’t have an induction stove, however, you can get similar performance for a slightly lower price. It’s never a bad idea to buy inexpensive non-stick skillets in packs of more than one. This T-Fal two pack is incredibly affordable and gives you two pans: one for single eggs, and one for slightly larger dishes. 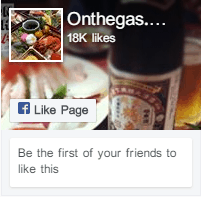 This means that your pans will wear out slower. In other words, this set should last you twice as long as a single skillet, letting you cook more worry-free eggs, pancakes, and crepes. Since this excellent set comes from a reputable brand, you don’t have to worry about the quality, either. This is important, because there are two things that I look at in skillets like these. First, are they non-stick? This T-Fal set passes that test with flying colors. You can put a paltry dollop of oil in the pan and flip an egg on pretty much any heat level, no problem. Second, will the pan give out before the non-stick coating? In my experience, this is a definite no from T-Fal. Not only do their ceramic interiors tend to last longer than my optimistic expectations, the pans themselves are solid and hold up for many years with no issue. When combined with the low price, this two-pack of frying pans earns a solid, unconditional recommendation from me. Even if you already have non-stick skillets in your kitchen, consider picking up a pack to have as a spare. You’ll be pleasantly surprised at how well these super-cheap pans hold up. Fans of Blue Diamond say that the brand’s extra-durable non-stick coatings are the best that they’ve ever used. If you’re willing to spend a bit more on a ceramic pan, their durable construction and careful design will edge out the competition — slightly. Don’t expect a huge improvement over a brand like T-Fal. Instead, you’ll get a slightly heftier skillet with a coating that’s slightly less scratch resistant. In practice, both skillets will stop being non-stick over a similar time frame. Still, by choosing Blue Diamond, you’ll be able to enjoy the benefits of a quality skillet for several years. If you’d like a non-stick pot or pan, these options allow you to replace a single item in your larger set or experiment with a new style of cookware. I’ve included a handful of enameled pots in this list as well. While these pots fill a different purpose than ceramic non-stick, they’re very useful tools in the kitchen that remain easy to clean after years of use. This set of two GreenPan saucepans feature special walls that allow you to pour liquids with ease. This is an incredibly handy feature when it’s time to make stock or sauce, but it’s a surprisingly nice thing to have when you’re just pouring hot water out of the pot, too. It features aluminum pan bodies with steel handles and a Thermolon interior, which is one of the premiere coatings available on the market. Unfortunately, this set does not come with lids. 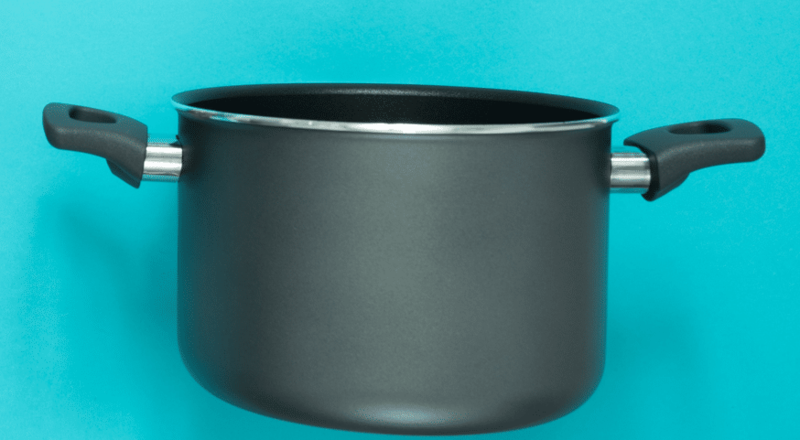 Customers suggest that it’s fairly easy to find a lid from another pot that will fit, which is great if you’re replacing part of a set, but isn’t very handy if you’re trying to boil a small amount of water in a new apartment. If you have 1 and 2 quart lids, it’s a brilliant buy, but if not, you should probably consider something that will trap steam (and heat) more effectively. For those of you who just want a basic lidded saucepan for pasta, rice, stew, and steaming, this lidded GreenPan is a brilliant choice. It’s still got the name-brand Thermolon coating, but it also features stay-cool ceramic handles that let you comfortably handle the pot after it’s been on the stove for a long time. The biggest problem here is the lack of induction compatibility. The aluminum body of this pan is non-magnetic, meaning it’s only suited for use with gas or electric cooktops. This is definitely the pot to go to if you want a cheap, reliable non-stick option for no-mess soups and stews. It’s not too big or too small, it comes with a lid, and the composite handles ensure everything is easy to manipulate while you cook. This genuine Lodge cast iron dutch oven is perfect for all of your slow cooking needs. The enameled interior (and exterior) of this pot doesn’t just look cool. Instead, it serves as an incredibly durable and fairly effective non-stick surface. You won’t be able to fry an egg in this pot with no spray, sure, but it’s definitely the tool you want to choose if your slow-cooked stews keep sticking to your stainless skillets. There are two things you’ll want to know before choosing this dutch oven, however. First, it’s big and heavy. It’s got a colossal amount of thermal weight, meaning it will take a long time to heat up, and once it’s hot it’ll stay hot for a long time. This makes it perfect for any recipe that you want to cook slow and low, including many soups and stews. Second, the coating is easy to clean, but not in the same way as traditional non-stick. Much like stainless steel, the enameled interior of this pot is pretty darn tough. If you accidentally make a mess (which is difficult, given the smooth surface), you’ll probably need to resort to traditional cleaning techniques instead of just wiping a sponge over it once. This might involve letting the dirty part soak in hot water or using some Bar Keeper’s Friend or baking soda as a cleaning agent. Afterwards, everything usually wipes off without too much effort. This particular dutch oven has all of the things you could want. It’s from a reputable brand (Lodge), it’s a pretty good size, it’s colorful, and it’s surprisingly affordable. Best of all, unlike the non-stick ceramic options on this page, you’ll be able to hand it down to your kids if you take good care of it. Enameled dutch ovens last pretty much forever. This fact has always made me somewhat leery of recommending a newer material over an older one. Sure, we know for certain that ceramic coatings are free of PFOA, but who knows what we’ll think about them in ten or twenty years? Part of me wants to say that it’s safer to stick to the chemical that we’ve been studying and debating for all this time instead of jumping ship to a lesser-known alternative. I do think, however, that we’re becoming more and more diligent with our safety checks. 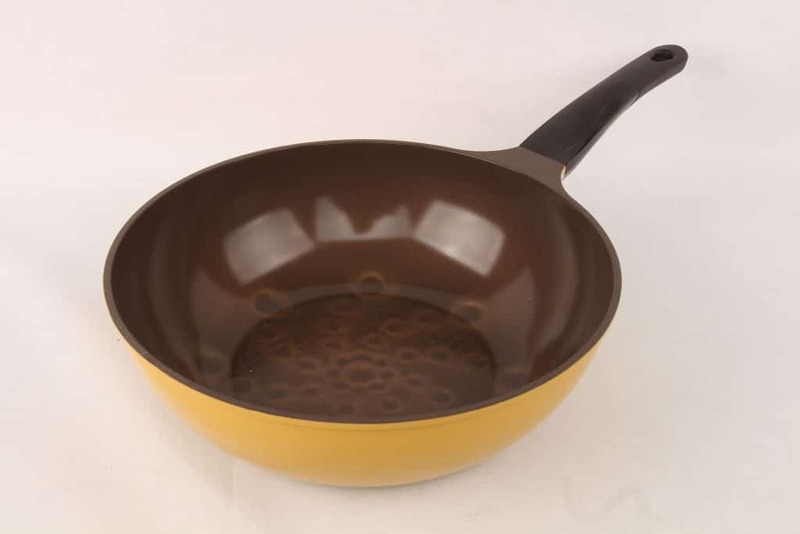 Modern ceramic non-stick interiors are made by professionals who take advantage of the latest scientific discoveries in their attempts to make safe, durable coatings for your pots and pans. This makes me fairly confident that the ceramic pots and pans that I use are perfectly safe. The experts think it’s safe, too. 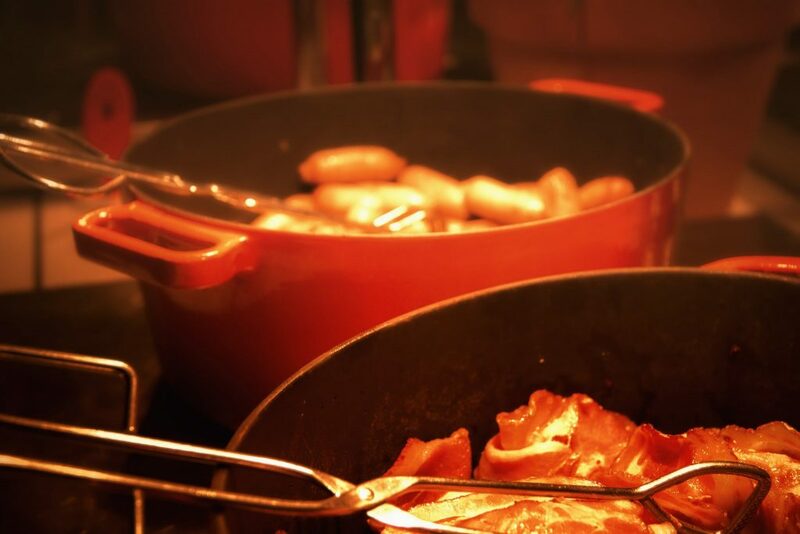 Modern regulatory bodies have expressed no health concerns about ceramic non-stick coatings. They also think that PTFE and modern Teflon are fine, however, so you shouldn’t view this as an advantage for one non-stick material over the other. One thing that regulatory agencies and cookware manufacturers don’t like to talk about is PTFE’s habit of releasing “toxic” gas at temperatures above 350 F. This is a pretty low temperature as far as cooking is concerned — it’s well below what you’d cook a frozen pizza at in the oven. 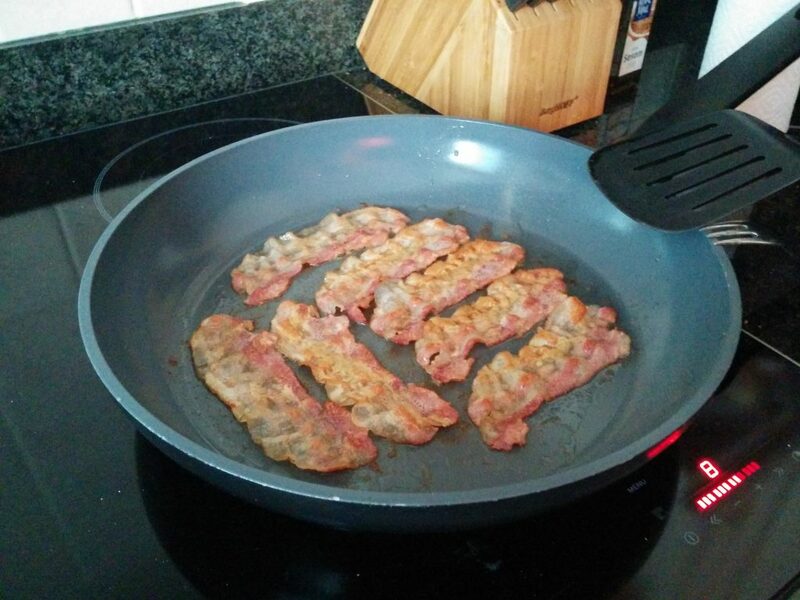 In fact, you can easily get a pan to 350 if you leave it on high heat for just a few minutes. Experts claim that this gas isn’t harmful to humans — it only gives us headaches — but it can kill birds in very small amounts. More modern PTFE coatings are more safe to higher temperatures, but every material safety sheet I’ve read has indicated that the coating will “offgas” at a temperature of 500F or lower. 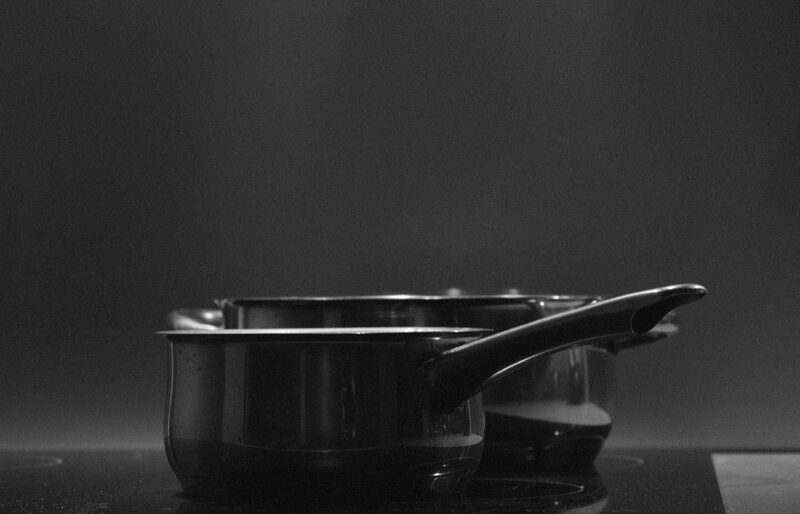 Ceramic cookware, by contrast, does not release fumes that are deadly to avians at normal cooking temperatures. Ceramics manufacturers will tell you with glee that their product is totally stable at up to 700F, which is true, but it doesn’t tell you the whole story. Ceramic interiors might be safe, but they’ll lose their non-stick properties fairly quickly if you let them get hot (in the range of 400F or so) too often. The bottom line here is that while we can’t be 100% certain that the stuff in our kitchen is safe, the real ceramic cookware dangers you should be worried about involve too much heat, harsh abrasive cleaners, and metal utensils. As far as your health goes, the professionals say that ceramic is totally fine. What About American Made Ceramic Cookware? Unfortunately, it’s ridiculously difficult to track down ceramic cookware made in USA. 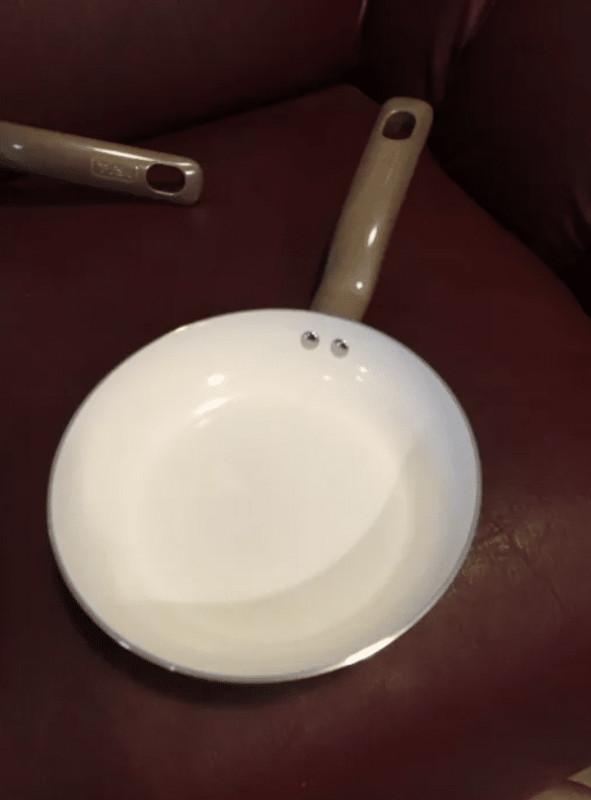 Brands that are normally notorious for their reliance on American workmanship (like Lodge) suddenly throw it all out the window when it’s time to add a ceramic (or even enamel) coating to a skillet or pot. I’m not sure why this is, but you should be very careful of purchasing anything that claims to be ceramic non-stick and “Made in America” on Amazon. Be sure to check both the product fine print and user reviews to figure out whether or not the pots and pans you’re looking at are really made in China. 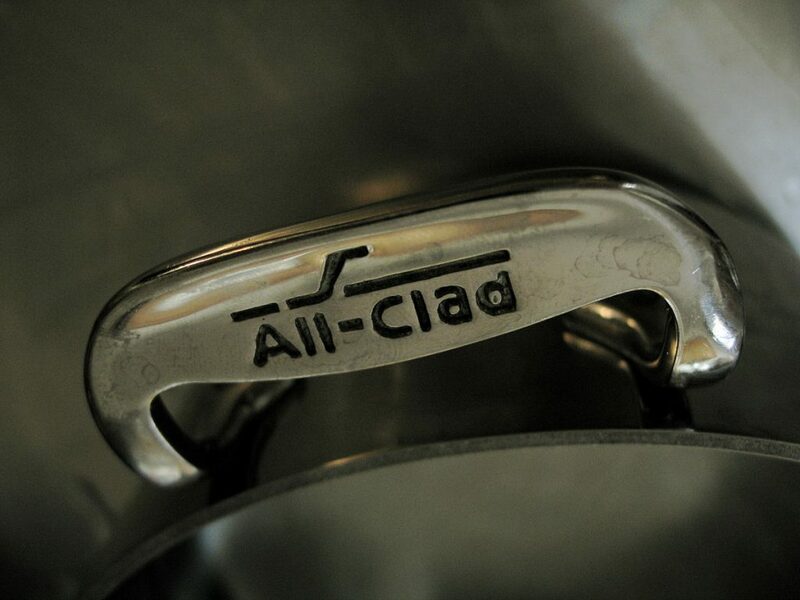 If you’re after American-made non-stick cookware, however, consider All-Clad. While their non-stick products are somewhat pricey, they’re actually made in America, meaning you’re supporting good old-fashioned US labor when you buy a pan. Be aware, however, that some amount of that money goes to Groupe SEB, the European conglomerate that owns All-Clad, T-Fal, and several other brands. If you’re just after a quick list to help while you shop, here are some of the big signs that I look for when checking out a ceramic set for the first time. You want a company that makes something else in addition to just ceramic pans. A company that makes both PTFE or Teflon coated non-stick and ceramic non-stick is perfectly fine. If they only make ceramic cookware, however, that should be cause for concern. There are a couple of foreign groups that make new companies every couple of years in order to flood the market with bad ceramic cookware, only to reform under a new name once consumers figure out that their pots and pans aren’t very good. 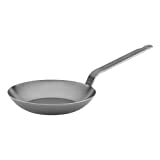 While ceramic doesn’t flake like Teflon does, it will eventually lose its non-stick properties after lots of stovetop (or oven) use. Make sure that you’re comfortable with the idea of replacing the set that you buy after two to five years. If that seems too expensive, look at a cheaper set or consider stainless steel cookware. 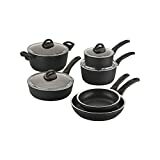 High-end ceramic cookware tends to have some pretty specific care instructions that are a lot more complicated than “turn on burner, add food, place in dishwasher.” A manufacturer that actually wants you to have a good experience will suggest that you add a small amount of oil, cook on medium heat or lower, and avoid harsh detergents and soaps. They’ll also advertise a more realistic oven-safety temperature — ceramic won’t release gas at high temperatures, but it will lose its non-stick properties pretty quickly at the higher end of consumer oven temps. In general, the easier it is for you to find these sorts of instructions, the more reputable the manufacturer is. It’s pretty much a given that ceramic cookware will fail. What’s not a given is “when.” Check out older customer reviews (especially negative ones) to get a feel for when people are saying that their cookware became unusable. Cookware’s longevity heavily influenced by how it’s cared for and used, but it’s definitely a good sign if there are a bunch of people saying that their set lasted for three or more years with no issues. This one might not be a big issue in some households, but if you plan on using an induction range (or hotplate), you’ll definitely want to find cookware that will support this trending technology. 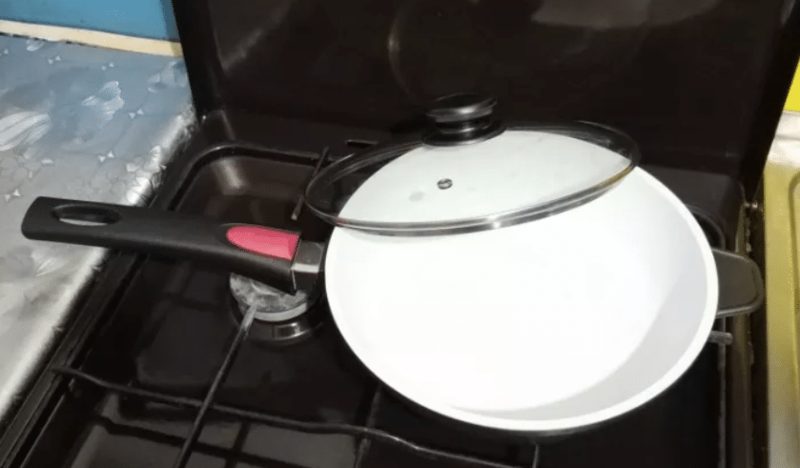 Your pots and pans will need to have a decent amount of magnetic material in the base in order to actually get hot when you put them on the range. Make sure that the product is explicitly capable with induction; Amazon frequently adds the “induction” tag to products that specify that they do NOT work on induction ranges. Non-stick cookware is a blessing to the busy chef. Instead of having to fiddle with your burner settings, watch your food carefully, and use lots of unhealthy, unappetizing fats to help your food flip, you can simply add a few drops of olive oil and make perfect eggs with your eyes closed, literally. 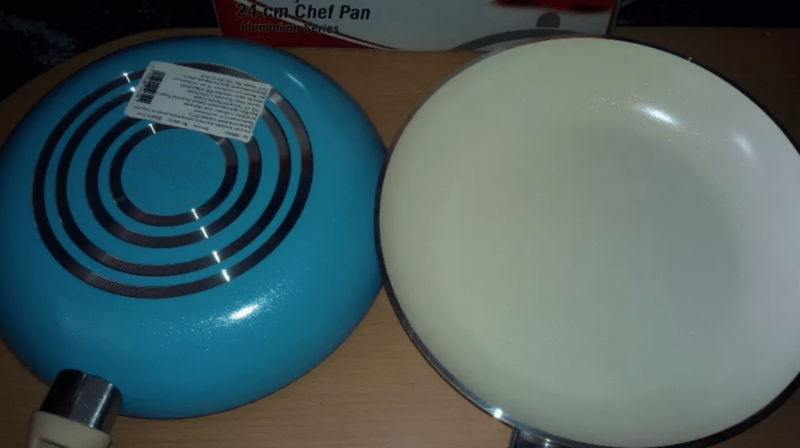 If you’re worried about the health concerns that have popped up around Teflon or you don’t want your non-stick coating to emit toxic gas, ceramic cookware is the right choice for you. Modern ceramic pots and pans are just as non-stick as their PTFE counterparts and totally safe, meaning you can have the convenience of non-stick without worrying about your health. There are lots of ceramic options on the market, however. The sets and individual pieces above represent some of the best ceramic pots and pans on the market. Whether you want a budget set to quickly fill out your kitchen, a single skillet to try out ceramic for yourself, or a mixed set with stainless pots and ceramic pans, one of the options above will fit right into your cupboards. You’ll be cooking effortless eggs and flipping fabulous filets in no time, all while avoiding Teflon’s toxic gas and the extra calories from having to use lots of butter or oil.